Our thermometer changes colors when it detects a fever, and it flashed red and beeped its little alarm at us last night. My daughter hit the couch after school and by dinner the fever had come on strong. Not too alarming. Nothing to be afraid about. Just an unexpected temperature spike at the end of a day when she had felt just fine. She asks me questions with increasing concern, though. What if I feel fine in the morning, do I really have to miss school? Do I have to stay out the whole day? I assured her that yes, fever tonight means no school tomorrow. No question about it. It takes a few questions of my own to root out the cause of her concern. She’ll miss a quiz that she’ll have to make up on Monday and that will take away time from something else she really enjoys at school. Oh, and she’s supposed to get extra recess as a reward for some work she did over spring break. Plus her friends will worry because they have a big project they are all working on together and she doesn’t want to let them down. It all seems so “big.” So very vital. So much to miss out on. So much reason to feel pressured and anxious. But I ask her this: What’s the worst that can happen? It feels like I’ve been asking that a lot lately. When we chat about scheduling classes for next year and my soon-to-be high schooler feels like she has to make every decision perfectly or her whole life will be forever stunted, I ask the question then, too. It’s not a magic question that solves every problem, but it’s been changing our perspective a bit. What’s the worst thing that could happen with these high school decisions? High school goes terribly wrong and it’s all a mess and a nightmare, so we do something else. We ask God for new direction and we leave that school and make another plan. We have options and possibilities. Nobody is stuck here. So, we calm down. We breathe a little deeper. We know the worst thing doesn’t often happen, but even when it does, God is with us. He’ll take care of us. We’ll be okay. I asked it again last night of a little nine-year-old girl who is stressing out over missing a Friday at school. What’s the worst thing? You miss out on some special activities and you have to make up some work on Friday. That’s disappointing maybe, but it’s something we can handle. I don’t want to trivialize this in any way. Mostly, we’re fighting back the enemy of anxiety, of worry, of fretting over every day situations. Like when I’m waiting on one child to be dismissed from an activity and they are running late. Ten minutes late. I’m starting to freak out a little bit and I’m catching my breath more than a little bit. Then I think about what’s true. The worst thing here is that we’re 10 minutes late to the next activity on the night’s agenda. And a few minutes late to the next thing after that. And dinner is a bit rushed. That’s not worth hyperventilating over in a pick-up line. But I have also felt the sweetness of the Lord in the hardest seasons, His gentleness, His grace, His kindness, and His loving, faithful presence. “Behold I am with you always,” Jesus promised (Matthew 28:20). Am I the kind of girl who frets over a broken pitcher or who rejoices over the clarity of light? Maybe right now I’m mostly a girl who reacts to the broken pitcher. I’m upset about the brokenness, maybe upset about the inconvenience, or the change in the plans. Maybe I even worry so much about whether the pitcher will break that I’m afraid to be bold, to take risks, to walk in faith. Fire drills, tornado drills, lockdown drills, oh my! All kinds of drills, she says. They were only about two weeks into the school year at the time. They had a tornado drill. My oldest daughter chimes in about ‘lock-down drills,’ and how her teacher is so funny but the one thing she is super serious about is anyone who dares to giggle, laugh or even squeak out a hint of noise during a lockdown drill. “She’ll send you to the principal,” my daughter lowers her voice for added drama. These older girls of mine try to reassure the youngest sister that drills are essential and there to help and not really a big deal. But the baby girl is testing out fear here. I can see it on her face and I hear it in the way she keeps bringing these drills up. When she gets home from school. Over dinner. In the minivan. As she climbs into my lap for bedtime prayers. Clearly, they are on her mind. And we older and wiser ones keep jumping in with confidence that everything is fine and not to be afraid, but she’s just not convinced. So, the fear is kind of leaking out of her heart and into our conversations. Those drills are there to keep you safe. So that if anything ever happens, you’re not too scared to do the right thing. We drill now so we don’t have to be afraid later. She nods knowingly, but I’m her mom and I know we’ll probably have this conversation again in a month when the alarm goes off at school and all the kids file outside for yet another fire drill. So we pray about it, every time it comes up, I pray peace for her. It’d be nice, it’d be great, it’d be heaven really if we didn’t need drills, if we didn’t have to practice for fire or intruders or tornadoes or a world of harm and hurt. But we live here, on a broken earth with sin and natural disasters and trouble. And how we react in the crisis makes a difference. I know this because haven’t I been alarmed and sent into a dizzying whirlpool of fear at the slightest provocation? A Facebook post, for goodness’ sake. Maybe you, too? The doctor’s report, the bill in the mail, the late night call, the hurtful remark, the broken car (again), the sobbing friend? Trouble storms into our lives and how we react in the crisis matters. We’re tempted to freak out and run around like a wild woman with her hands flailing hysterically in the air. We’re in crisis mode. Making phone calls. Feeling hopeless. Crying desperately. Feeling helpless. Rallying the troops and sending out an SOS signal and doing anything possible to keep from drowning. I’ll be honest, sometimes it doesn’t even take a crisis, it just takes one tiny bump into my plans for the day for me to settle into a funk of frantic activity and aggravated grumpiness. 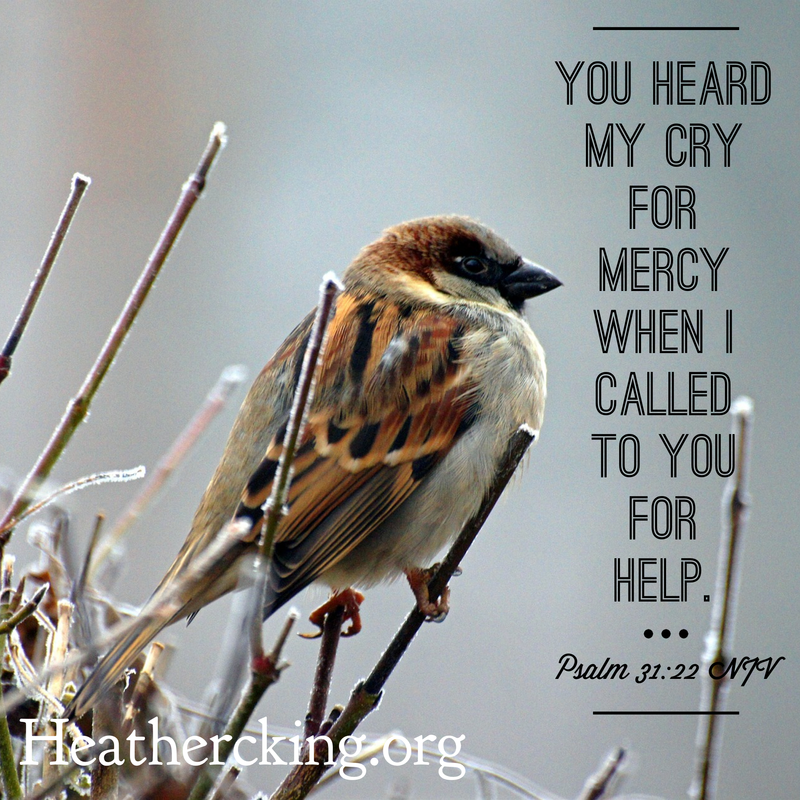 when I called to you for help (Psalm 31:22 NIV). In our alarm, when the bad news comes and we haven’t had time for faith to kick in, we snap to the judgment that God has abandoned us. We’re cut off from Him, alone, dependent on our own strength to get us out of this mess. Our natural reaction to an alarm is haste and hysteria, foolishness and fear. It’s unnatural to choose peace under pressure. Yet, the Holy Spirit offers us just such unnatural, supernatural peace. In the haste of the moment, he had rushed into fear. But then he saw what was true, God had indeed heard His cry for help. Cry to God for help. Trust Him to hear your call. Rest in the assurance of His presence. Not flaky peace, vague peace, warm-and-fuzzy-feeling peace, or the peace of blindness to our circumstances. The peace that is the confident assurance of Christ’s presence right where we are. Bravery doesn’t run rampant in this house. My girls and I freak out about bugs. We grab for a dry towel when water splashes into our eyes. We talk through all possibilities and potential scenarios so we won’t freak about what’s new and different. We inch into doorways when there’s a room full of new people. We’re not adventurers or discoverers, explorers or conquerors. We’re not risk-takers or rock-the-boaters. We’re not the movers or the shakers. No, we’re planners and organizers. We’re the faithful and the hard-working and the folks dipping their toes in all gentle and nervous on the side of the pool to test the waters before jumping in. That’s why we celebrate every victory in our house, every display of courage and every hint of bravery. When my most fear-prone daughter announced this was the year she was really going to ride an actual roller coaster instead of the kiddie ride at Busch Gardens, we cheered her on. I took pictures. We celebrated and high-fived after her victory. And when my older girls went on to try out other roller coasters, we looked straight in their eyes and told them we were so proud of the courage in them. Even when my one daughter tried a roller coaster and hated it and complained that it was creepy and made her afraid, we still celebrated because she tried it. But to overcome her fears and try at all—that’s courage. We celebrated a daughter not crying or freaking out over allergy testing and a toddler who climbed up onto the potty. In just a few days, we’ll cheer them on as they step onto a yellow bus and head off to a new classroom, with a new teacher, and new classmates. I’ve been spending all these years of motherhood cheering for my daughters to have courage. It’s okay to make mistakes, so just give it a try. God is with you, so don’t fear. Just relax and trust Him. I tell it to them and maybe along the way I’m preaching to myself. Sure there are plenty of other kids who have faced down bigger and badder roller coasters than we’ll ever dare to try. We’re no daredevils after all. But still, that’s not the same as true bravery. Bravery doesn’t require doing what everyone else is doing or trying to keep up with or match the accomplishments of others. Courage is so personal; it’s not about you being like anyone else. And, while not feeling any fear at all can make you look courageous on the outside, it can also make you foolhardy. That’s not what courage is. Being brave isn’t the same as being unafraid. Bravery means doing the right thing no matter what, even if you tremble in your sneakers and even if your stomach flip-flops with fear. You trample all over the anxiety and the worry and the fearfulness and you do it anyway. You don’t let fear control you, imprison you, or hold you back from what God has called you to do. Those men and women of courage in Scripture didn’t follow God without facing their own fears. “All the king’s servants and the people of the king’s provinces know that if any man or woman goes to the king inside the inner court without being called, there is but one law—to be put to death, except the one to whom the king holds out the golden scepter so that he may live. But as for me, I have not been called to come in to the king these thirty days” (Esther 4:11 ESV). Esther, the poster-child for Biblical courage, was scared out of her mind. She knew she couldn’t obey God on her own so she asked her to people to fast and pray with her for three days before she finally set one foot in front of the other and walked into the throne room to see the King. She was terrified. But she took a stand anyway. 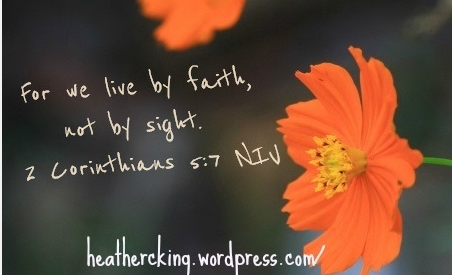 That’s being brave: Obeying God even when you’re afraid. God’s calling can cost us. It can be frightening and unsettling. He can ask you to face down giants or ask you to face down change or ask you to face down the unknown. 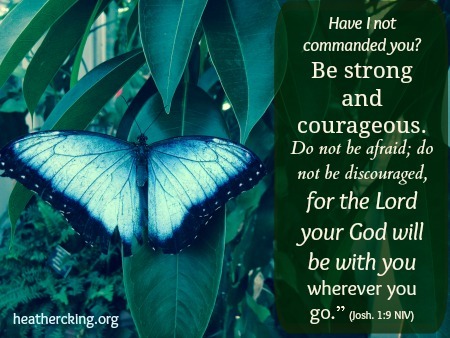 In all circumstances, he tells His people to “Be strong and courageous.” He knows, after all, that we aren’t naturally strong or naturally courageous. But He also knows we take courage from His presence. We called her our Roller Coaster Baby. My middle girl was a fearless climber and intrepid explorer in her younger days. When she played with Daddy, she always wanted to go higher and faster. We thought she’d be a mountain climber, an adventurer, a bold and brave pioneer, who wouldn’t be intimidated by peer pressure or life’s obstacles. From the first time that word rolled off her tongue, she changed. Her reaction to every movie or TV show, every playground, every game was, “I’m scared.” To emphasize it, she would clutch her arms around her body and tremble. Now, she’s growing up afraid. She’s afraid of heights. She’s terrified of spiders. She can’t sleep in the dark. Most movies are off-limits because any bad guy of any kind ‘creeps her out.’ She can’t sleep with her head uncovered at night for fear of intruders and murderers. Unfortunately, this middle girl of mine is passing her fear on like a worn-out, unwelcome hand-me-down. My youngest girl is a brave soul, taking on challenges and amusement park rides with courage. But last night, her older sister’s fears trickled down to her. This little one couldn’t stay in her bed, couldn’t sleep in her own room, couldn’t turn out the lights. She was tearful, fearful and overcome. She had learned that you were supposed to be afraid. I’m discovering that fear is a cursed ill-fitting hand-me-down that we sometimes pass on to one another. At the very least, I know one thing with certainty–fear isn’t something given to us by God. It’s never part of His plan for us. He wants us all to be intrepid explorers, brave pioneers, and valiant defenders of what is right and true. Instead, we are run-out-of-the-room afraid. We are hide-our-heads-under-our-blankets scared. “God gave us a spirit not of fear but of power and love and self-control” (2 Timothy 1:7, ESV). We trade in the gifts that God’s given, of power, love, self-control and peace, for a fear-filled life and anxious hearts. It’s a learned trait. At some point, someone we respect and believe in tells us to be afraid and suddenly the childlike fearlessness of our innocent days is tainted and torn. Or we are hurt and abandoned, abused, or neglected and we learn what it means to be terrified. Or circumstances just loom so impossibly over our shoulders and our practical minds assure us that destruction is imminent. Whatever our story is and no matter who or what it was that first shoved fear into our hands, it’s time to stop agreeing to the exchange. It’s time to stop accepting hand-me-down terror. It’s time to fight for the gift God’s already given us—peace in His presence. Remember that “with His love, He will calm all your fears” (Zephaniah 3:17) and even “though I walk through the darkest valley,I will fear no evil, for you are with me” (Psalm 23:4). We don’t know the future. We don’t know all the reasons for evil and pain in this world. We don’t understand everything that happens and we’re not guaranteed perfect lives of comfort and prosperity. But we don’t have to be afraid. God has lavished us with perfect gifts—peace, love, self-control, power. He promises to be with us, wherever we go, whatever we face. That’s a gift worth keeping. Don’t trade in that promise for anything. 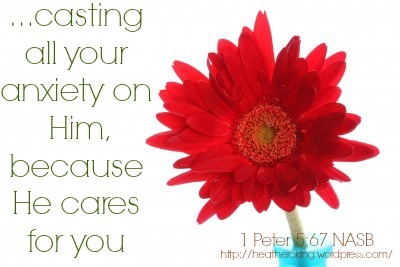 To find more verses on fear and worry, click here. Ask Me More: Why are you afraid? I wake up from the nightmare. It’s about 4 a.m. maybe. I can’t see the clock without my glasses, so I guess at the time. Dreams always remain hazy for me, but I remember what finally startled me awake: my daughter in the dream crying out, desperately broken, desperately sad. It’s the second time I’ve dreamed about this one baby girl of mine being hurt, and I can’t shake the terror in the night or my helplessness. It’s just a dream and yet it seemed so real. I could do everything right as a mom and still get it wrong. I could do everything right and still I can’t protect them all the time. I pray it over each of my children by name. Pray until my heart calmly slips back into its normal rhythm. The next day, my family drives to church and unloads from the minivan in a stead stream of King family members. But my other daughter lingers, hiding her face, and I see how she’s turned her back to the door. She’s been crying. She sobs it out and I try to interpret the shoulder heaves and breathy story. We’d been listening to the song Blessings by Laura Story in the minivan. What if your blessings come through rain drops, what if your healing comes through tears? Until finally, I whisper into her ear as she bows her head low….Look, I get this. Your mom has been a fearful person. I know what it’s like to be afraid. But you don’t know that anything bad will ever happen. You can’t miss out on enjoying the present for fear of an unknown future. The only thing you do know is that God loves you, God loves us, God will be with us. I give her these two choices, cut through all of the possibilities and the confusion, the philosophy, the emotions. Just this: Fear or faith? And I think how I need this myself, as a woman, as a mom. I can live in fear or I can live in faith. I can parent in fear or I can parent in faith. The disciples rocked violently in the wind of a Galilean storm on a boat they knew how to handle expertly. They were fishermen, well-versed in weather and weathering the storms on that sea. But they were scared that night. Terrified even. This storm exceeded their ability and expertise. They could not survive alone. And where was Jesus? Sleeping while they struggled? Ignorant of their need? They woke him and poured out frustration and fear in a torrent of accusation, “Teacher, do You not care that we are perishing?” (Mark 4:38). So, Jesus spoke to the waves and wind and they obeyed Him and settled into a calmed hush of stillness. Then he turned to those still-shaking disciples, dripping wet and exhausted from their battle with the storm. He didn’t lecture them or give a sermon on His power or His mission. He didn’t command that they also hush and be still. Those are the only options. That’s what His questions mean. The disciples felt justified in their fear, perhaps. Surely they should be afraid when an overpowering storm threatens to capsize their boat and drown them all. But Jesus pushed beyond their excuses and reasoning to reach the real issue: We can’t be afraid and full of faith at the same time. It’s an either/or state of being. One, the boat will not sink; it cannot sink when the Master of ocean and earth and sky is in it. Two, the storm will not last forever. And that’s faith; it’s returning to what I know instead of worrying over the unknown. So, I choose faith over fear this time. But it’s a journey. I must choose faith and choose faith and choose faith, not just once, but every time I’m tempted to question God’s presence, His love, or His power. Want to read more about the questions God asks? Check out my book, Ask Me Anything, Lord, available in paperback and for the Kindle and nook! He wasn’t but a few hours old when the questions began. I wonder. 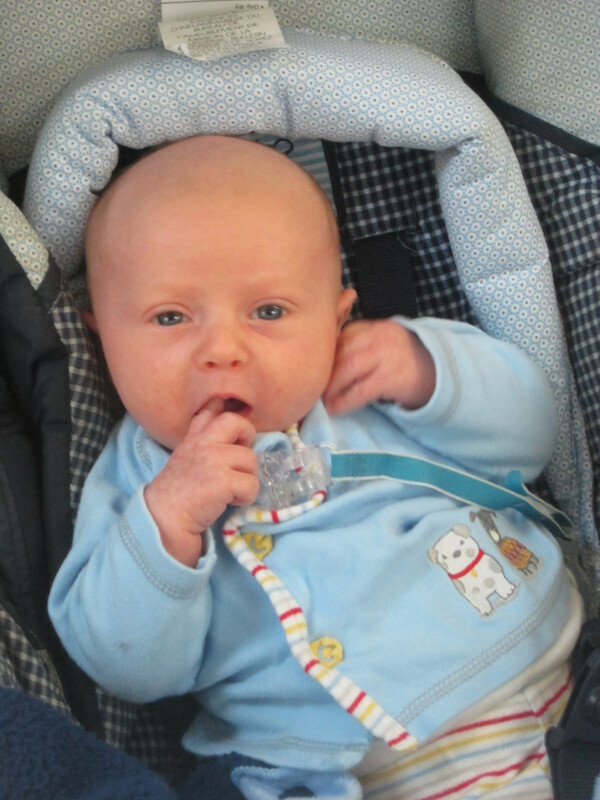 These eyes, this nose, his little round face and fuzz of light brown hair…do I see a reflection of me or are these my husband’s features in our newborn son? The opinions differ, this person…that person….there’s no consensus here. That’s what we decide, not so much that my son looks like dad or mom. Instead, he looks like a “King baby” and the comparisons are less with his parents and more with his sisters—these sibling counterparts with shared DNA. I think of my own reflection and how people have told me my whole life that I look exactly like my mom. But this light brown hair, my blue eyes, my fair skin, my (unfortunate) chin….those aren’t my mom’s features. Those belong to my father. So maybe the essence of who we are truly overcomes the external and influences—maybe even determines—the way others see us. People can look right at me and yet see past all that is physical to the spirit within. And so the apostle Paul could see past body frailty to find faith in a man. In Lystra there sat a man who was lame. He had been that way from birth and had never walked. He listened to Paul as he was speaking. Paul looked directly at him, saw that he had faith to be healed and called out, “Stand up on your feet!” At that, the man jumped up and began to walk (Acts 14:8-10). How many people had looked directly at that man and seen only external limitation? From his birth, he’d been crippled and all through childhood he’d been defined by disability. Yet, his faith was so great, so overpowering, as to be his greatest noticeable characteristic when Paul looked his way. How could it be so clear, so definitive in one lame man among a mob of many? What does such faith look like? What are its features? If someone looked at me in a crowd, would they see this faith above all else in me? It must have been mountain-moving faith the man had. The kind that makes room for miracles and doesn’t crowd them out with doubt rooted in practicalities and self-reliance. Could I have faith so bold? And daily faith, what about that? Would Paul have seen faith in me amidst the most minor of daily annoyances, the stresses of the schedule, the disappointments of the moment and the way I have to face up to my very own mistakes and failings? Doesn’t that take faith also? To choose not to make a forgotten phone call a crisis or a lost library book or the 5 minutes on the clock screaming at me that we’re late or my mistake from rushing too much (yet again). How we react in the most mundane of stressors reflects our faith or lack of it. Do we trust that God has everything under control? Yes, the overwhelming issues we can’t possibly handle, but can we trust Him even with our calendar and our kids’ homework and our grocery bill? And, if He is so trustworthy, why then fret and fear instead of relax easy into the trust that is faith in a God so mighty and so merciful? The Proverbs 31 woman “can laugh at the days to come” (Proverbs 31:25). She has no fear of tomorrow or any days after that and no worries over what-if’s and hypotheticals. She has faith. And it shows up in her demeanor, in her belly of laughter instead of a wrinkled face of worry. As a face is reflected in water, so the heart reflects the real person (Proverbs 27:19 NLT). This reflection of mine should radiate faith, confident assurance that God is who says He is and He will do what He says He will do. It’s the firm, unshakeable belief that whatever I face any day in this world is in His hands and never beyond His control or His caring. Who do I look like, then? Oh, I hope it’s a woman of deep, unshakeable faith and that it’s written all over my features and in every part of my being so you could pick me out in a crowd and know I belong to my God. Heather King is a wife, mom, Bible Study teacher, writer and worship leader. Most importantly, she is a Christ follower with a desire to help others apply the Bible to everyday life with all its mess, noise, and busyness. 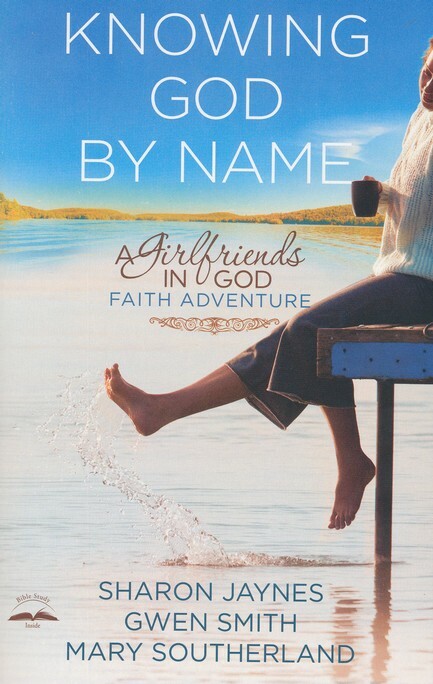 Her book, Ask Me Anything, Lord: Opening Our Hearts to God’s Questions, is now available! 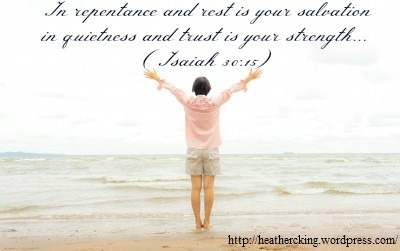 To read more devotionals by Heather King, click here. She stood in the back, penned in on all sides, standing in the tall grass, watching as we passed, fluffy and off-white, round and full, appearing like a tangled mess of cotton balls with black sticks for legs. The other animals interested my daughters more. They hovered around the bunny hutch, chasing the rabbits from side to side, squealing over so much cuteness. We peered into the dark of the pigs’ hut, spotting amidst the piles of hay tiny piglet ears and little piglet eyes that peeked out and then dodged back down for more napping. The baby goat, calmer than most goats we’ve met, lingered at the fence edge so we could pet him and coo over his sweet friendliness and gentle ways. At the pumpkin patch that day, we hunted for clues scattered throughout the farm and then unscrambled the letters to decode the hidden message—all for a prize, of course. The clue took only a second to find, the marveling over the other farm animals took a bit longer, and then off the girls ran to hop onto the wagon for a hayride out to the fields. But me, I could linger there for a while because amidst hay and signs teaching the kids that male turkeys are called “Tom” and a hen lays one egg a day, was another sign. That sheep. The one in the back. The one that just stood watching us run around like excited suburbanites out in the country for an outing…. 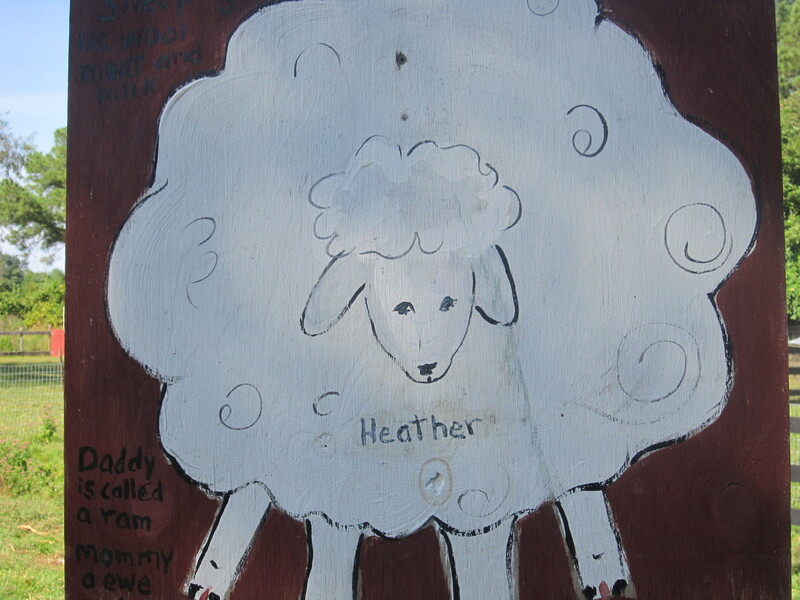 That sheep was named Heather. I snap a picture of the sign, hoping I’ll remember the truth found here at the pumpkin patch. Heather, the sheep, that’s who I am: the one in need of a Shepherd, the one who is fearful, the one who needs tending and continual leading, the one who can’t find her way to safe pastures or make decisions on her own. Heather, the sheep who thinks she’s a farm laborer at times, meant to haul burdensome loads on her back, forgetting that sheep aren’t burden-bearing animals. God didn’t make them to carry the weight or the responsibility, not like the oxen, the horses, the donkeys even. We’re not meant for hauling around concerns, cares, or worries. Sometimes we can’t even stand on our own feet all in our own strength. Our Shepherd doesn’t load our shoulders down with packs and plows; sometimes He hoists us up onto His own strong shoulders and carries us instead. He bears the burden when we cannot. “Sheep don’t come across as stressed-out creatures… Sheep don’t worry about where their next meal is coming from, if they will have a place to sleep each night, when the next enemy or thief will attack, or even what the next day holds. When sheep are sick or in need, they simply turn to their shepherd, instinctively knowing he or she will take care of and comfort them (p. 125). They simply turn to the Shepherd, just one swift movement from worry to trust, handing it over to the one who cares for them, never doubting, not for one brief stressful moment, that the Shepherd loves them, cares for them, knows best, and will provide. “I am the good shepherd; the good shepherd lays down His life for the sheep” (John 10:11 NASB). He did this for us, so great a sacrifice for such small creatures, such fearful ones, not the strong or the hardy, but the weak and fearful who are so easily led astray and scattered at the slightest sign of danger. “The needs of sheep, compared to the needs of other animals, are greater because of their instinct to be afraid, and when faced with fearful situations, to run. Sheep can never be left alone. They often stray, requiring the shepherd to find and rescue them” (p. 123). And He does this, too: traipse over wilderness to lead us back, pull us all cowering out of the crevices and corners where we’ve tried to hide away in our terror. He gives us constant attention, eternal love, continual faithfulness. Yes, He lays down His life for us. That’s the sacrifice He gave once for all. But He doesn’t abandon us even now, rescuing us from predators, battling off the enemies that threaten to devour, bringing us back from the places of foolishness we’ve wandered to. Why tug burdens onto shoulders not meant to bear them? Why plot my own course rather than trust His lead? Why tremble at enemies when my Shepherd will fight for me? I’m a sheep, so simple, so weak, so well-cared for. That’s what a sign on a post at the pumpkin patch reminds me. My one girl gets grumpy. I arrive to pick her up at the end of an activity and I find her huddled on the floor, back turned to the crowd, face hidden on her knees or maybe she’s hiding under a table or in the back of a bathroom stall. She’s not screaming or crying, but she’s definitely pouting. With arms crossed, with feet stomping, with loud harumphs for emphasis at the end of her sentences, she tells me the crisis: Others disagreed, someone else wanted the same thing, another person got to go first, that person got something better. But this is the bottom line: She didn’t get her way. I understand. I can be grumpy when I don’t get my way, too, wanting to sit out and let everybody know that I disagree with the decision and I’m sure not happy about it. Another of my girls argues her case when she doesn’t get her way. She argues….and argues….and argues her point until you’re knocked over by the powerful wave of her emotions and opinions. And I understand this. When I don’t get my way, I want to form protest marches and fight, fight, fight, too! Instantly I think of who I can rally to “my side” and how I can convince others that my way is the right way, the best way, the only way. Maybe if I just give the best speech, argue the best (or loudest, or longest, or most convincingly), use the best evidence and form the largest coalition I’ll win the day after all. And my youngest girl simply cries over disappointment, not a temperamental tantrum on the scale of the hurricane tantrums we’ve seen in this family. More like the desperately sad wail of a child who realizes the world doesn’t revolve around her…doesn’t always do what she wants or turn out the way she expects. That’s a lesson that always stings painful and I’ve mourned myself with frustrated hurt that the world doesn’t bend to my whim or orbit around my convenience or comfort. I don’t always get my way. And, selfish creature that I am, I sometimes react all ugly. Yet, while faith allows us to stand up for what is right and to speak truth in love, it demands something else. Faith means trusting God even when things don’t go our way, when plans don’t work out, when others make decisions we disagree with, when life isn’t perfect or even when life is hard and obstacles loom large and hope doesn’t come easy. Believing in God’s providential care isn’t faith until we’re blinded by circumstances and still trust. Faith: That’s when we can’t see the end, can’t see how God could possibly work this out for our blessing and benefit, can’t imagine what God could possibly do to make this better much less make this the best. But we trust Him anyway. Faith means resting in the knowledge of God’s power over everything we face, even when our senses and circumstances tell us that people are in control, not God. It seems like we rely on a boss, or a leader, or a committee chairman, or a judge, or someone in human resources ….but faith declares that it’s God, always God, only God who directs our lives. God, my Shepherd! I don’t need a thing. when you walk by my side (Psalm 23 MSG). Yes, God my Shepherd leads me to places of rest and sustenance, providing what I need, sending me in the right direction, walking by my side even in the shadowy depths of the valley. And my response can be fighting or pouting…but all my grumpiness, my protesting, my tears reveal where I’m not trusting God’s ability to control the tiniest detail of my life in His hands. Enough of the ugly reactions, the crisis, the conflict. Better to seek my God—-what now, Lord? What is your will here in this place? What will you have me do and how would You have me respond? I choose resting in Him. I choose a quieted heart. Right now, he’s linked to me, soaking up nutrients and oxygen from my very blood, connected to me by a stranded cord that is his very grip onto life. But there’s the delivery room and suddenly we’ll no longer be one tiny human and one mom adhered together into a cohesion of flesh and blood. He’ll be held by the doctor and I’ll grab for my glasses to see this separate person, this tiny creation who has been nudging at me all these months and growing inside of me all this time. For nine months you can only imagine his face, imagine what gymnastic feats he’s performing as he knocks your pregnant belly from side to side. Then I’ll see him. Then I’ll hold him. Then we are two. Right there in that moment when the doctor holds up a baby and announces, “it’s a boy,” right then he is on a journey to independence and I’m the one who is supposed to train him for that. I have time to cuddle, to pray, to advise and teach, to tussle blond hair and put the Band-Aids on the scraped knees, but only for so long. Enjoy it. Don’t miss it by blinking too long, my older and wiser mom-friends tell me. Independence comes soon enough. My eight-year-old daughter announces she wants to home school for college so she doesn’t have to leave home. My four-year-old daughter declares that she’d just like to keep this family and not have one of her own. It began in the delivery room, the separation from me, the first breath of their very own lungs taking in that air all on their own and so it goes. This is my job as a mom, to love them into independence, teach them how to do and what to do on their own. Abide in Me, and I in you. As the branch cannot bear fruit of itself unless it abides in the vine, so neither can you unless you abide in Me (John 15:4 NASB). This abiding life, the never separating from God, never stepping out on my own and depending on my own strengths or abilities sounds so simple. It takes effort to remain in Him. Dependence after all can feel so uncomfortable, so helpless, so out of control, so uncertain. 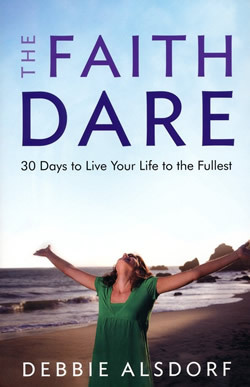 for thirty days you will be placing your self and what you want to do aside, replacing them with the truths in each day’s dare, and concentrating on what God is saying to your heart that day (p 15). Maybe it’s normally food (chocolate or soda for me! ), or media, or social media that makes up our fast. Denying self means this sacrifice of what we want in order to pursue God’s heart, throwing down idols and strongholds and choosing Jesus, just Jesus, only Jesus. But maybe for me “fasting of self” means a denying of self-reliance, self-assertion, self-direction. It requires that submissive gentleness, the willingness to follow God’s lead wherever, whenever, without worry or anxiety about the journey’s destination or timetable. Control, worry, anxiety–remove the deceptive disguise and what lurks there? Therefore humble yourselves under the mighty hand of God, that He may exalt you at the proper time, casting all your anxiety on Him, because He cares for you (1 Peter 5:6-7 NASB). By casting all your anxiety on Him. One way to be humble is to cast all your anxieties on God. Which means that one hindrance to casting your anxieties on God is pride. Which means that undue worry is a form of pride (Future Grace p. 94-95). It’s my stubborn independence borne from this ugly pride that stirs up worry, after all. I fret because I’m trying to make every detail fit together just right, every problem solved, every conflict resolved, every decision made just perfectly. I’m trying to do it. I’m reasoning it out, planning in the night, charting possibilities on paper. Daring faith is denying independence and choosing dependence, throwing over the pride that says, “this all relies on me” and purposefully resting in Him. All of them seemed ready to show off that day. The morning was cool, that one break in the summer heat and the chance to enjoy outside without dehydration, heat stroke, headaches and fatigue. So, we packed a picnic lunch and visited the zoo, even zipping up jackets at the start of the day because of the chill in the air. On a cool enough day, the animals in the various habitats are willing to leave dens and the burrows under the earth that protect them from the sun. The prairie dogs bobbed up and down. The giraffe paced back and forth, his nose barely missing the walkway for zoo onlookers where we stood. The elephant tossed his hay and the baby monkey swung on ropes and tumbled all over his ever-patient parents. Always the lions sleep on the highest rock in their habitat, hot day or cool day or whatever. They lounge and stretch and only occasionally blink their eyes open long enough to yawn and maybe reposition their mass to ease into a more comfortable position or soak up more sun. Years and years we’ve been visiting this zoo, and I’ve never seen the lion climb down from the rock, never seen him roar or shake his mane. We’ve never seen the female lion dash across her habitat, stalk imagined prey, or be alert for danger. Still we marvel at their sheer magnificence, the mightiness of their demeanor. How their muscles still display power even when they look just as lazy as my two house cats asleep on the arms of our sofa or the foot of my bed. And we take pictures them, of course. I have just about six years of pictures of these lions resting on the rock. I’d think perhaps that their lack of care or nonchalant attitude is simply the fate of the captive lion. They feel safe in their man-designed haven, provided for and comfortable. When a strong young lion stands growling over a sheep it has killed, it is not frightened by the shouts and noise of a whole crowd of shepherds. In the same way, the Lord of Heaven’s Armies will come down and fight on Mount Zion (Isaiah 31:4 NLT). Their serene appearance is deceiving…the reason they can be so relaxed is that they have nothing to fear–no shortage of food and no natural predators. The lions look lazy and listless, but they are the strongest and fiercest of all. One roar sends all the other animals running for their lives. (Our Daily Bread, JAL). They have nothing to fear. 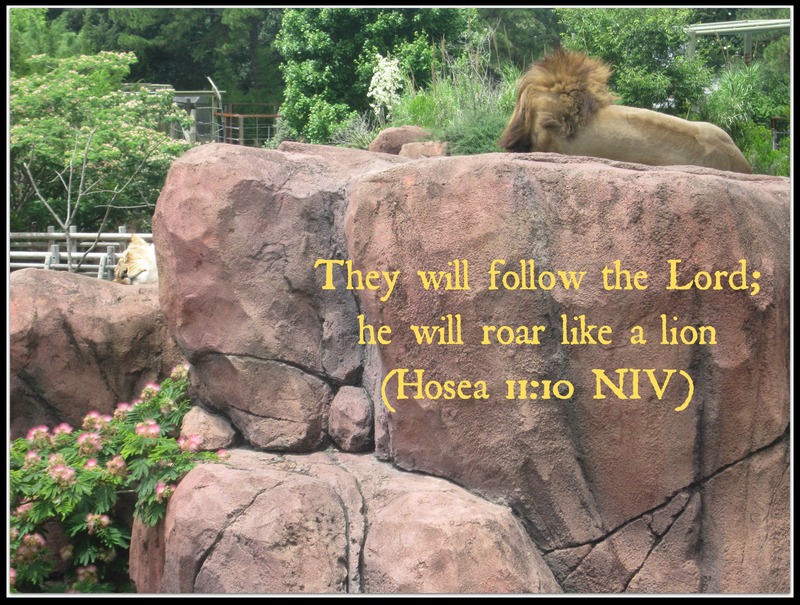 That’s why the lions don’t stay alert and awake on that rocky cliff. It’s why they don’t take shifts of standing guard or pace around their zoo enclave with nervous awareness. It’s why the same beasts out in Kenya feel free to lounge and linger as they drink from a stream and slowly stride through the grass rather than run, stalk, or pounce. Isaiah writes that this is true of our God, this Mighty Warrior as He leads the armies of heaven, undaunted by opposition. Oh, but how I tremble and pace with anxious uncertainty! How one phone call or email, one personal confrontation, one malicious bump into my carefully planned schedule, one interruption, one comment by another can leave me feeling so shaken and, yes, afraid. And why, I wonder at times, am I reacting this way? Isn’t this in God’s hands? Even the decisions of others, the way they seem to hold power over my future or the ability to hold sway in my life, is just a ruse. And why, I wonder, does it seem like God is lounging on the mountain rather than roaring and shaking His mane and displaying His might? Why can I be in a nervous tizzy of reactionary emotion and He’s not flustered or bothered? He’s calmly in control. It’s because our God has no reason to fear. No need to tremble at the noisy clamoring of our enemies, our frustrations, our annoyances, our worries and obstacles. And it is our Lion of Judah, our all-powerful God, who gave Isaiah “a strong warning not to think like everyone else does. He said, ‘Don’t call everything a conspiracy…don’t live in dread of what frightens them. Make the Lord of Heaven’s Armies holy in your life. He is the one you should fear, He is the one who should make you tremble. He will keep you safe” (Isaiah 8:11-14). We aren’t to worry because we fear only God–no other crisis or threat or shaking of our life–and we know He keeps us safe.